Trailhead and parking area are on Gale River Loop Road in Bethlehem, NH (summit is in Franconia). Gale River Loop Road is on the south side of Rt. 3, 4.4 miles northeast of Rt. 93 at Exit 35 and 5.5 miles west of Rt. 302. Note: Gale River Loop Road is a loop which has two endpoints on Rt. 3. The mileages given are for the western entrance, which is closer to to the Garfield Trail parking area. This end of the road is just west of the bridge over the Gale River. Drive 1.1 miles down the road to the parking area. Standing prominently midway between the massive Franconia and Twin Ranges is Mt. Garfield. 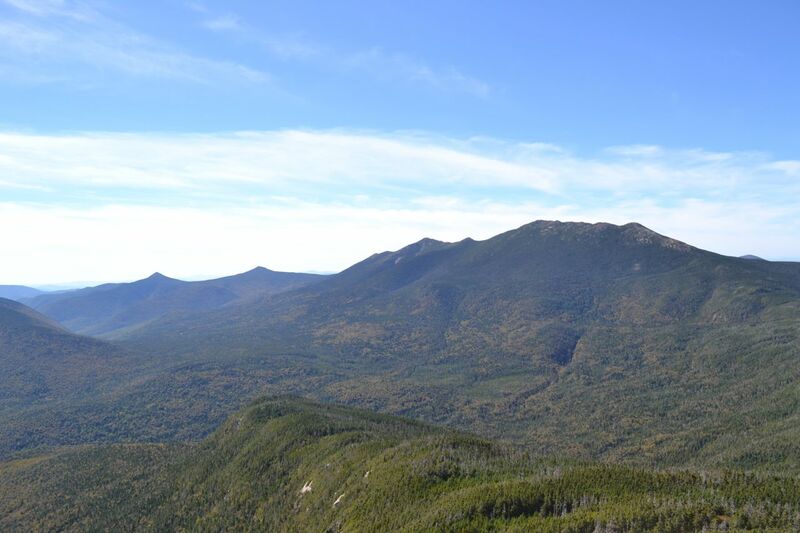 This pyramidal peak is considered by most to be a top competitor for the best viewpoint in the White Mountains. While hikers usually choose another mountain for their favorite, Mt. Garfield's incredible vista is worthy of much praise for its own unique qualities. For example, its relatively low elevation (to the ranges on both sides of it) give Mt. Garfield a close-up view of the Pemigewasset Wilderness unlike that of the higher peaks. Finally, its extensive view into the Great North Woods is every bit as good as that of the higher mountains beside it. The only way to hike Mt. Garfield alone on a day-hike is to ascend from the north on the Garfield Trail. While the large elevation gain (over 3000 feet) may seem daunting, the trail is very gradual and spreads the climbing over the entire trip. The most difficult part of the ascent is a rocky 0.2-mile section at the very end of the hike. Otherwise, the only difficult part about this trek is the fairly long distance. The trail begins high above the Gale River's south branch at very little incline. It winds through a grove of small fir trees and continues above the brook. After a while, the trail descends to cross a small stream, then travels to an old road which was once used to access a fire lookout station on the summit. The trail will follow this road almost all the way to the top. It crosses Thompson Brook after one mile, then makes two quick crossings of Spruce Brook; both brooks empty into the Gale River's south branch. The grade gradually increases on a long, flat section; then the trail makes a few turns and ascends along the side of a ridge. Eventually, it turns to the right and passes close to a beautiful birch forest. After climbing over a small knob near Burnt Knoll and descending slightly, the trail turns sharply on the first of seven switchbacks. The first three are long and gradual; the last four are steeper and much shorter. Near the top of the switchbacks, the trail passes by a blowdown patch in which there are several large trees with hanging mosses. At the turn of the seventh and last switchback, a noticeable herd path takes off through the open woods to the south. For a worthwhile side trip, you can follow this path for 0.2 miles (not included in hike mileage; adds 0.4 total miles to trip) to the northern end of Garfield Pond. Just note that this informal path may be difficult to follow and you should pay attention to any turns you make while walking it. Garfield Pond is a beautiful and small grass-lined waterbody lying on a small plateau on the west side of the mountain's summit. The Garfield Ridge Trail passes by the opposite side of it, but no official trail connects it to the Garfield Trail, which is why the herd path has developed. It is possible to navigate to the other side of the pond to take the Garfield Ridge Trail to the summit and make a loop, but it is easier to just return the way you came to the Garfield Trail. After that last switchback, the trail resumes its straight, gradual climb along the side of Garfield's summit cone. At 4.8 total miles, the trail ends at Garfield Ridge Trail. Turn right and make a steep, rocky 0.2-mile climb. Look for an opening on the left side of the trail, where you can follow the open ledges to the summit of Mt. Garfield. There are views in all directions from the summit. The view can be seen all at once from atop the tall concrete foundation of the former fire lookout, which rests at the very top. To the east, Garfield Ridge leads past Galehead Mountain and AMC's Galehead Hut to the huge South Twin Mountain; the Northern Presidentials peek over North Twin. Behind a spur of South Twin is the tannish-brown colored Mt. Guyot and the three Bonds: Mt. Bond, West Bond, and Bondcliff. Behind Bondcliff is Mt. Carrigain and to its right is Mt. Hancock. Off in the distance are the Sandwich Range and the mountains near Waterville Valley. Far below you is Owl's Head Mountain, rising out of the Franconia and Lincoln Brook Valleys. The pointy peaks of Mt. Flume and Mt. Liberty and the lofty Franconia Ridge make up the Franconia Range to your right. Cannon Mountain and North Kinsman can be seen over the side of Mt. Lafayette. To the north are the very distant mountains in Vermont and the Great North Woods. Most noticeable are the Pliny and Pilot Ranges and the closer Cherry Mountain.